Reverse osmosis, or (RO), is a water purification technology that utilizes a semipermeable membrane to remove the dissolved ions and minerals from water to produce high purity water. 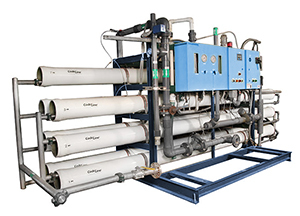 An Industrial reverse osmosis system is designed to be a part of an overall water purification system used in commercial and industrial applications. In a reverse osmosis system, one side of the water purification tank has unprocessed water and pure water on the other side, separated by a semi-permeable membrane. We would apply pressure to the untreated side of the tank, enough to counteract the natural osmotic pressure from the pure water side and then to push the untreated through the membrane, thus adding fresh water to the water side, and leaving the unpurified remains on the other. All Water Systems has over 30 years of water purification experience including designing, installing and servicing reverse osmosis systems. We assist companies in a wide range of industries and applications to realize optimal water purification through reverse osmosis. Cold Water Line Valve: The water source for the RO system. Pre-Filters: Can be made up of several filters, usually one for solids and sediment removal and additional filters using activated carbon for additional impurity removal. Reverse Osmosis Membrane: A CTA (cellulose tri-acetate), which is chlorine tolerant, and the TFC/TFM (thin film composite/material), which is not chlorine tolerant are the heart of the system. The unit holds layers of membranes and allows for a large surface area for the water to move over. The layers which look like plastic wrap trap impurities and allow the water to exit the system in a purified state. Post filters: After the reverse osmosis process, the water may be run through an activated carbon filter to remove any addition impurities or odor. Automatic Shut Off Valve (SOV): To conserve water, the RO system has an automatic shutoff valve. When the storage tank is full (this may vary based upon the incoming water pressure) this valve stops any further water from entering the membrane, thereby stopping water production. By shutting off the flow this valve also stops water from flowing to the drain. Check Valve: A check valve prevents the backward flow or product water from the RO storage tank. Flow Restrictor: This device maintains the flow rate required to obtain the highest purity water (based on the gallon capacity of the membrane). It also helps maintain pressure on the inlet side of the membrane. Drain line: This line runs from the outlet end of the Reverse Osmosis membrane housing to the drain. This line is used to dispose of the impurities and contaminants found in the incoming water source. In addition to design, installation and service of industrial reverse osmosis systems, we also provide membrane cleaning services for the 4” and 8” RO membranes-- click here for more information. For More Information on industrial reverse osmosis systems, call (412) 824-6560, or click here to contact us.